Well this sure has been an interesting election season. As if it were even possible, the tone of this election seems uglier than the last, which was uglier than the one before it. For most of our country’s history, there have been Republicans and Democrats. We’ve always debated and quarreled. We’ve always disagreed on things. But it seems as if something has changed. The bickering has devolved into outright rancor. The political tone has gotten so…hateful. In the aftermath of 9/11, those who opposed the war were often called un-American. When Barack Obama was running for president, those who opposed his ideas and policies were often called racist. Our political discourse has gotten reductive and personal. We are no longer people with a set of political preferences; we are reduced to adjectives, insults, and epithets, and often offensive ones at that. We are no longer multi-faceted humans; we’re Republicans or Democrats, liberals or conservatives. In 1960, researchers asked a mix of Republicans and Democrats if they would be “displeased” if their child married someone from the other party. Only 5% of Republicans and 4% of Democrats answered yes. Then they were asked if they would be “pleased” if their child married someone within their same political party. Two percent of Republicans and 3% of Democrats said yes. No one cared much one way or the other. In 2008, polling firm YouGov asked a similar question. This time, 27% of Republicans and 20% of Democrats said they would be displeased if their child married someone of the opposite party. Just two years later in 2010, those numbers jumped to 49% and 33% respectively. These sets of data speak to a larger trend: since the late 1970s, American politics—both among the politicians and we the people—has grown more and more divisive and polarized, recently reaching record levels. There are several indicators of polarization amongst politicians (“elite polarization”), like roll call analysis, use of the filibuster, interest-group ratings of congressmen, and surveys of party activists; they all point to a clear and widening partisan and policy divide in government. Our politicians are the most polarized they’ve been since the late 1800s. 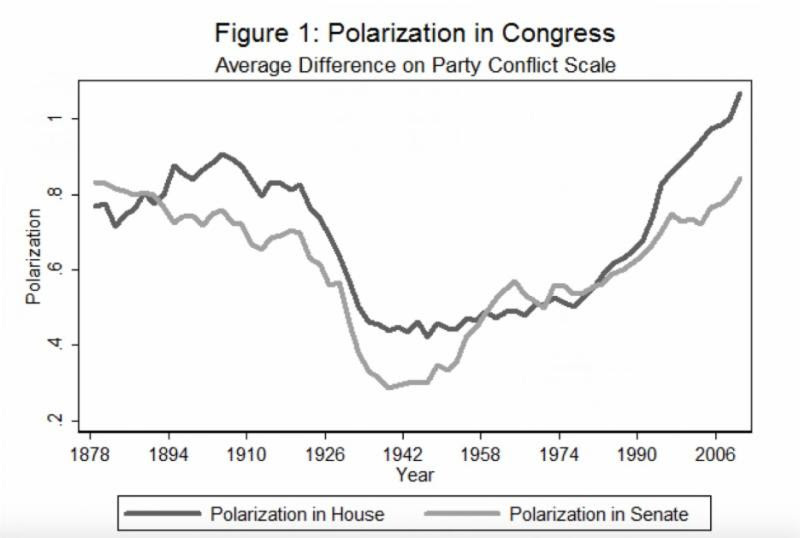 The following chart shows party polarization in the House of Representatives from Reconstruction to today. Where 0.0 is total agreement on issues, moderates sit within the -0.25 to +0.25 range, and any Republican deviation above this range and Democrat deviation below indicates an increasingly extreme position. Since 1978, our feelings about the opposing party (described here as a “feeling thermometer,” which is the degree of favorability) have been on a general decline, with a steep drop after 2000. Our feelings about our own party have also declined, but not as sharply. Unquestionably, we have seen growing polarization on the citizen level (“mass polarization”). The great irony of it all? The strangeness behind all this? There is data that shows that most “non-activist” Americans have remained relatively centrist on the issues, and certainly more centrist than those we elect. While the share of Americans who define themselves as consistently liberal or consistently conservative has jumped from 10% to 21% in the past 20 years, that leaves 79% of us Americans who are not ideologues and tend to hover closer to the center. If that’s the case, then what’s driving all this disdain for the other party? The data shows that the majority isn’t sitting there thinking, “I’ve grown more conservative [or liberal] in my views, therefore I have pushed myself farther away from the average Democrat [or Republican] and now have less tolerance for their views.” The thinking would have to be something more like, “It’s not that I’ve gotten more conservative/liberal, it’s that you, Democrat/Republican, have become a nutjob extremist.” But there’s data that just doesn’t show this. More confusing still, our tendency to vote strictly along party lines has grown, but our views on issues have remained generally the same. While the people we elect are getting more extremist, the people these politicians represent have remained relatively centrist. Google “why has political polarization increased,” and you will learn there is agreement that polarization has intensified since the late 1970s. But there is little agreement as to why. Political polarization has typically been defined by disagreements over policy. By this definition, plenty of data show that our politicians have become increasingly polarized in the past four decades. But if there’s data that shows most Americans have remained centrist on the issues, then policy polarization can’t be enough to explain the disdain that the average Republican today feels for Democrats and vice versa. Shanto Iyengar, director of Stanford University’s political communications lab, wanted to reconcile the conflicting data around how much we have or have not deviated from the center with data that simultaneously points to mounting hostility for the other side. To do this, he and his team deduced that the policy-driven definition of polarization is too limiting to get at why we loathe the other party. So they set out to study mass polarization based on a different assumed driver: affective identity, or social/group identity. In other words, mass polarization is no longer issue based or ideological. It’s personal. It’s emotional. And it’s fear based. Oh great. Take an experiment Iyengar and a colleague at Dartmouth did with student resumes. They asked 1,000 participants to look at the resumes of two high school seniors to determine which one was more qualified for a scholarship. The resumes were subject to one of three alterations: 1) the student could have either a 3.5 or 4.0 GPA; 2) the resume could list that the senior had been the president of the Young Democrats or Young Republicans club; 3) the student’s name could have been stereotypically African-American (and that person listed as having been president of the African-American Student Association) or stereotypically European-American. When a resume had mention of political affiliation, 80% of Democrats and Republicans suggested the scholarship be given to the student whose party affiliation aligned with their own. Political party trumped GPA. When the Republican had the higher GPA, Democrats only chose the Republican 30% of the time. And when the Democrat had the higher GPA, Republicans only chose the Democrat 15% of the time. How did race play in? When participants saw resumes of two equally qualified candidates, 78% of African Americans chose the black student, and 42% of European Americans did the same. When presented with a resume where the student of the other race had a higher GPA, 45% of African Americans chose that student, and 71% of European Americans chose him. Our political biases now appear to trump our racial biases. Where does this end? We’re potentially not marrying people based on politics. We’re potentially not rewarding merit where it’s due based on politics. What about choosing where we live? Americans have been moving to more politically likeminded enclaves. Our presidential elections increasingly show what’s referred to as “landslide counties,” where the majority of votes in a county go to one candidate. In 1976, only 27% of voters in presidential elections lived in such counties. In 2008, that number had jumped to nearly 50%. Not surprisingly, this is contributing to “ideological silos,” where our friend groups are getting drawn along party lines. About 63% of consistent conservatives and 49% of consistent liberals say that most of their friends share their political views. The more we shut ourselves off from people with perspectives different from our own, the more “other” they become. If our party politics is creeping into our judgments about most or all facets of our lives and coloring our judgments of things that are not political, how can we call partisan politics anything but a new kind of discrimination? Look up the definition of discrimination, bigotry or prejudice…Our climate of politics seems to fit the bill. The difference, according to Iyengar, is that political bigotry is the only kind of bigotry where the derision is actively permitted and encouraged. “Political identity is fair game for hatred,” Iyengar says. If you are concerned about what might happen to our country when the other party is in power, then above all you have a vested interest in reversing this climate of hatred. Here’s why: evidence shows that our climate of hate is what is driving our politicians to become more extremist. We—ourselves, our neighbors, our coworkers—are not the ones who can directly cause our country to go to hell in a hand basket, whatever that might mean to you. But the increasingly extreme politicians can. 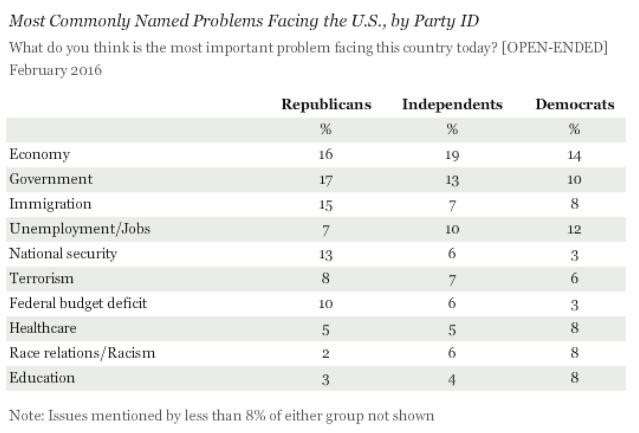 Recall, after all, that most Americans appear to remain centrist on the issues. 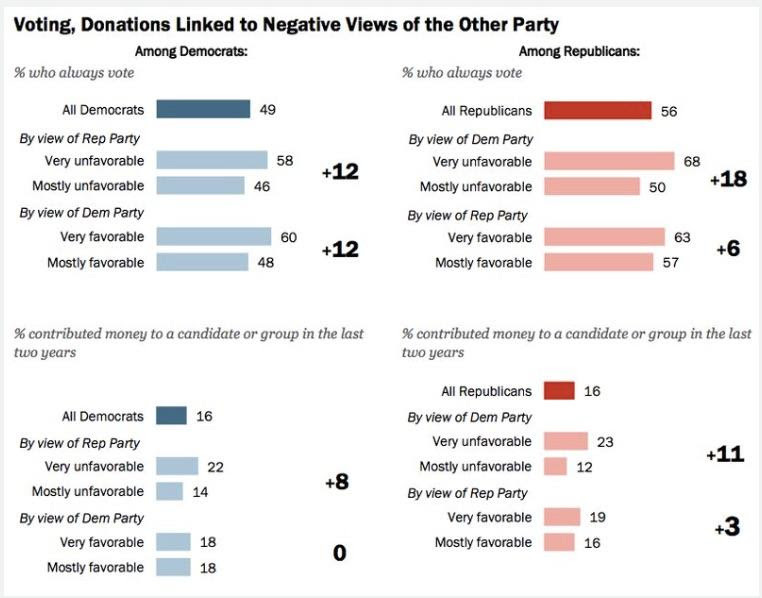 This powerful chart from Pew shows that the more you fear the other side, the more likely you are to vote for and contribute money to the candidate on your side. Politicians have an incentive to keep it this way. The more hate they spew about the other side, the more they stoke your fear and motivate you to donate to their campaigns and vote for them. The more they position themselves as “ideologically pure,” the more you will believe they are principled in their intent to stop the other side, even if you don’t care as much about ideological purity (and the data show you don’t). The incentive not to reach across the aisle is reinforced—and bought and paid for. Meanwhile, Congress’ diminishing productivity has caused a frightening imbalance in the constitutional distribution of powers by motivating executive and judicial encroachments on legislative prerogatives. And now we are in vicious cycle. Politicians are elected and reelected not on the legislation they can get through, but on the legislation they can thwart. Contributing to gridlock and legislating with so-called ideological purity, often measured by what one can stop, is now the name of the game. Moderates have gotten squeezed out and are getting elected in smaller numbers. (From Jimmy Carter’s Congress to George W. Bush’s, the percentage of moderates in Congress dropped from 30% to 8%, while the percentage of “strong” conservatives or liberals grew from 27% to 57%.) Extremists tend to raise more money and have more electoral muscle. (An example: In 2010, Representative Michelle Bachman raised more money than all 48 members of the moderate Blue Dog caucus combined.) Those who can win are those who are willing to claim the party line and demonize the other side to get that perfect sound bite that ripples across the 24-hour news cycle...rinse and repeat. We are besieged by messages that propagate hate and prejudice for the other side. The climate of fear has grown so intense that we are driven to vote against, not for, candidates. We might not particularly like the person running on our party’s ticket, but we despise the person running on the other ticket. Our politics have become about stopping people, not electing people. If this is true, then it seems to suggest that if we want to ebb the tide of ever-extreme politicians, perhaps we the people have to redirect some of that disdain for the “other” party towards the politicians and candidates who seek to exploit our fears for their self-preservation. Maybe it’s time to shift our intolerance of the other party to the media, who paints caricatures not just of those on the other side, but of you as well, laughing all the way to the bank as they do. Maybe it’s time to resist the knee-jerk reaction, ignore the sound bites, and instead put our attention to what’s in our control to reverse this trend of candidates at the hilt. And maybe it’s time to accept that if we want to exercise our freedom to believe what we want, we have to let others do it, too. After all, what’s the goal? 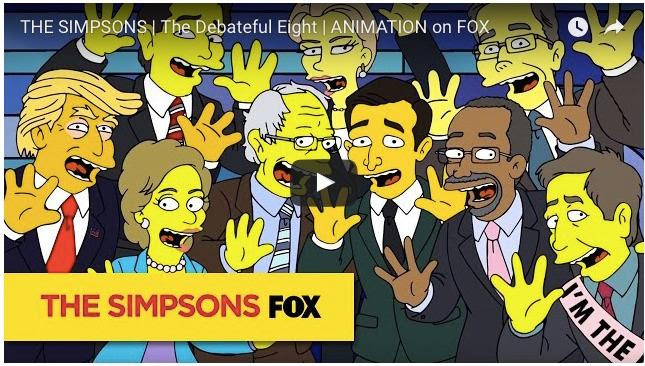 To create some sort of monolithic, homogeneous electorate that shares one brain? Or live in a thoughtful democracy that can sustain, function and protect our freedoms and provide productive infrastructure for economic prosperity? In this TLV, as primaries pick up and chaos unfolds, we will explore the historical context of our modern day polarization, additional theories as to how we got here and what it means. But first, some levity amid the lunacy. For those of you finding yourselves…underwhelmed by this year’s presidential candidate pool, you are not alone. Marge Simpson is, too. To recession or not to recession, that is the question. Debate is escalating over the prospect of a near-term recession. Goldman Sachs recently issued an “all is going to be fine” report, while Citibank suggested the risks of recession seem to be growing rapidly. Who is right? Either could prove right. There are so many factors at play, including the price of oil, the pace of economic activity in China, the amount of monetary stimulus by central banks, the prospect of debt defaults in certain commodity-based countries, the possibility of further conflict in the Middle East, what the Federal Reserve does with interest rates and anything else we may not have even considered. Shifts in any of these economic influencers could tip us towards or away from recession. These days, managing the economy seems to be about as easy as managing the weather. One thing is for sure; recessions are a natural economic occurrence. In the United States we normally have at least one recession every decade. Since our last recession was in 2008/2009, that puts us seven years out from our last downturn. The odds seem very high we will experience another recession within the next three years. Since we unleashed shock and awe fiscal and monetary stimulus to pull ourselves out of 2008/2009, how capable are our tools to combat the next one? It should be no surprise that the Fed desperately wants to increase interest rates so that when the next recession hits, they at least would have lowering them as an available stimulus tool. There’s a little joke about the difference between a recession and a depression. A recession is when your neighbor loses his or her job. A depression is when you lose yours. Everyone in the oil patch is starting to think a short-term recession is now looking more like a long-term depression. Employment in the producing regions of oil and gas has imploded over the last eighteen months, yet the headquarters jobs in places like Houston have only recently begun to fall. The field hand must be fired by the field manager, who must be fired by the regional manager, who then must be fired by the regional vice president that sits in the corporate office. It takes time for job contraction to work its way to company headquarters. The lag effect of oil patch job contraction has recently reached corporate jobs. As oil patch bankruptcies and company combinations rise, senior and middle manager white-collar jobs are going to take a pretty good beating. Beyond the oil patch, job growth seems to be continuing, but the sector leaders of employment growth are relatively low-paying service jobs. Economy does not benefit greatly when it adds a $40,000-a-year retail or social service worker as it looses a $100,000-a-year oilfield worker. The oil patch is in a gold rush bust. If this bust seeps into the general economy, then maybe Washington policy makers will finally realize that natural resources, and the industrial production they enable, is something that deserves support rather than being regulated out of business. We can’t save the world from climate change, if such exists, if in doing so we destroy our economies. There is no progress without adversity. How would humanity have ever gone from the cave to the tepee to the stick hut to the log cabin to the stone house to the brick house to the high rise? All progress requires some sort of adversity to put human ingenuity to the task of making things in our world better. Everyone knows the saying that necessity is the mother of invention, but so too is adversity. Adversity is not just the mother of invention, it is also the mother of get up and get after it. 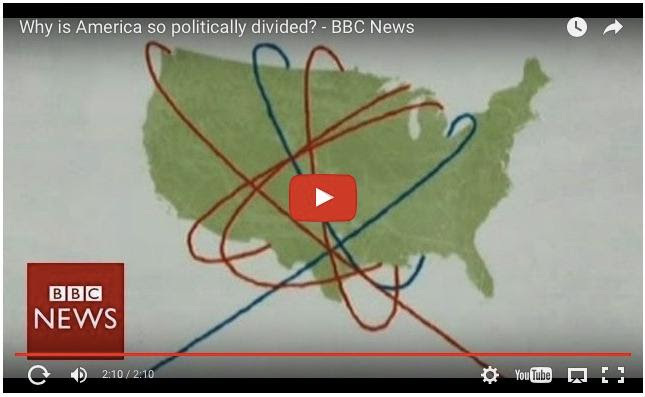 Pew & BBC: Why is America So Politically Divided? Based on a robust 2014 survey from Pew about the sate of polarization in America, BBC produced a brief video showcasing the major headlines. • The volunteer rate declined by 0.4% to 24.9% for the year ending in September 2015. About 62.6 million people volunteered through or for an organization at least once between September 2014 and September 2015. • The volunteer rate for men was little changed at 21.8% for the year ending in September 2015. The rate for women was 27.8%, down from 28.3% in the previous year. Across all age groups, educational levels and other major demographic characteristics, women continued to volunteer at a higher rate than men. • By age, 35 to 44 year olds and 45 to 54 year olds were the most likely to volunteer (28.9% and 28%, respectively). Volunteer rates were lowest among 20- to 24-year-olds (18.4%). Teenagers (16- to 19-year-olds) continued to have a relatively high volunteer rate, at 26.4%. Over the year, the volunteer rates for 35- to 44-year-olds and 55- to 64-year-olds declined. • Individuals with higher levels of education were more likely to volunteer than were those with less education. Among persons age 25 and over, 38.8% of college graduates with a bachelor's degree and higher volunteered, compared with 26.5% of persons with some college or an associate's degree, 15.6% of high school graduates, and 8.1% of those with less than a high school diploma. The rate of volunteering declined for persons across all levels of educational attainment in 2015. In 1950, the American Political Science Association’s Committee on Political Parties issued the report “Toward a More Responsible Two-Party System,” in which they called for more disagreement amongst the parties. Doesn’t that sound quaint? The committee’s rationale? The parties were too similar and too lenient with each other, leaving voters without a clear choice in the voting booth. The paper argued that for a democracy to be healthy, the parties needed to have two distinct agendas that could be advanced by a cohesive majority and put under scrutiny by a cohesive minority. When searching for the roots of our modern day polarization, most historians point to the late 1970s. For most of the South’s history, Democrats dominated. Jim Crow laws had been the party’s lock on Southern voters since the Reconstruction. From 1913 to 1960, there were no Republican senators in the South, and there had only been two before it. In general, Republicans and Northern Democrats supported Civil Rights. Southern Democrats did not. In 1964 and 1965, President Lyndon B. Johnson signed the Civil Rights Act and The Voting Rights Act, respectively, effectively ending Jim Crow and curtailing the anti-Civil Rights stance as a viable political platform in the South. It is said that Johnson confided he knew he’d signed away the South “for a generation” by alienating white, Democrat segregationists. He was right; by the 1990s, the South was routinely voting Republican. But why then would the South drift towards the Republicans, who were also pro-Civil Rights? 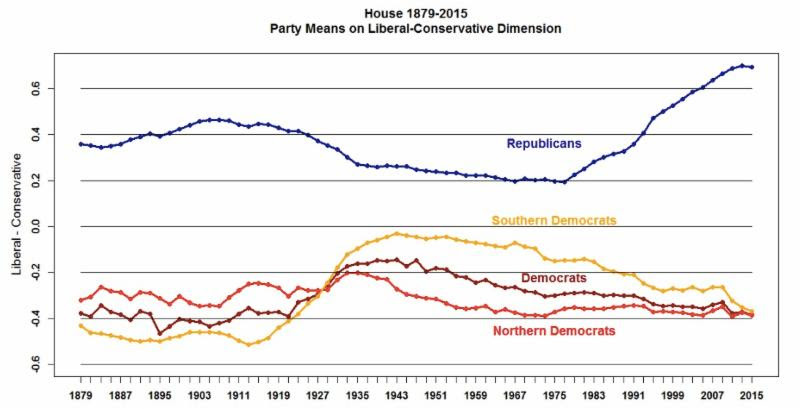 1) When looking at roll call data of exclusively economic issues, Southern Democrats had shown increasing economic conservatism dating back to the 1940s. When the issue of Civil Rights was no longer a practical option to stand against, Southerners were left to focus more on their economic preferences, which naturally drifted them towards Republicans. 2) Amid the spread of global Communism in the mid-20th century, the South was more anti-Communist than the rest of the country. Some attribute the South’s drift towards Republicans to their hawkish stance on foreign policy and containing Communism, which aligned more closely with the Republican agenda for swift, overwhelming force in Vietnam. 3) During the 1968 presidential election, candidate Richard Nixon operated under what has become known as the “Southern Strategy,” a savvy or cynical plan depending on your stance, to win the South. At this point, it was clear that the Southern Democrats, still reeling from Johnson’s Civil Rights Acts, were up for grabs. To court them, Nixon toed the line on Civil Rights, speaking in generalities on the issue as not to alienate either side. Nixon won just enough of the Southern vote to win the election. As president, Nixon and Republicans continued to court Southerners, a process that would persist for decades until a Republican South was fully realized by the 1990s. Whatever the cause, the net effect is that by the late 1970s, the period where Democrats and Republicans overlapped and crossed the aisle on many issues was over. With Jim Crow now illegal, the Southern realignment had begun to push both parties towards ideological purity, while also reducing the dimensionality of issues. 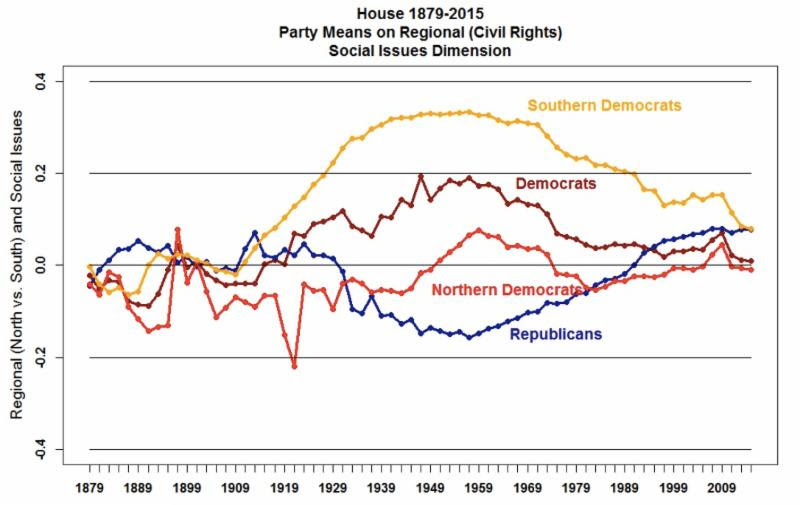 The following chart captures the ebb and flow of partisan polarization around the issue of Civil Rights in the House of Representatives. After Civil Rights, the racial-social dimension of politics turned into a question of redistribution and is now folded into questions of general economic debates. Voting in Congress today is one-dimensional about the role of government intervention in economic issues. Less dimension means less opportunity for party overlap. Between 1960 and 2008, the number of women with a college degree grew fivefold, spurring cascading social change. Research shows that higher education causes liberals and conservatives to become more liberal and conservative, respectively. Thus, more college-educated women meant a greater number of Americans with deeply held political beliefs…as well as newfound mobility. Increasingly, college grads began moving to cities that aligned with their political views. In turn, the preference to marry within a political party is that much more likely to be realized; a 2011 report found a 0.65 political correlation amongst spouses, one of the strongest of all spousal correlations. Politics has now become a “moderately” heritable trait, entrenching our mass polarization that much more. You stopped talking to your neighbor. Then your neighbor moved to a more likeminded town. Before geographic mobilization let us move towards the likeminded, our townshipped communities were more diverse. We regularly encountered and engaged with people of all mindsets. Policy expert and author Marc J. Dunkelman calls these casual acquaintances with whom we’d chit chat at the diner or on the front lawn the “middle ring.” Dunkelman blames the demise of this middle ring for our mass polarization. Today, our political frame of reference includes only our “inner ring” (those who know the personal details of our lives) and “outer-rings” (those Facebook groups of the likeminded we join, or those politically ideological newsletters we get, all of which validate our opinions). The middle ring was how we would give our assumptions a healthy challenge now and then, and how we would be reminded that those in the other party were humans, not aliens. The middle ring is how we kept from slipping into political bigotry. 1) Republicans have moved farther to the right than Democrats have moved to the left. Depending on where you get your news, this one might surprise you. While both parties have deviated from the political mean (the center), multiple indicators show that Republicans have deviated more than Democrats have. Since the 1970s, each new cohort of Republicans has taken more conservative positions than the cohort before them. This has not been the same with Democrats. What then has pushed them from the mean? One view suggests that the Democrat’s move to the left can be attributed to a decline in white representatives in the South and an increase in African American and Latino representation. 2) These days, we shamelessly and regularly brandish the filibuster to shut down the other party. Click here for the procedural specifics and history of the filibuster, a tactic to delay or stop the other party from bringing legislation to the floor. Historically, it’s rarely been used. Now we use it all the time to thwart the opposition. 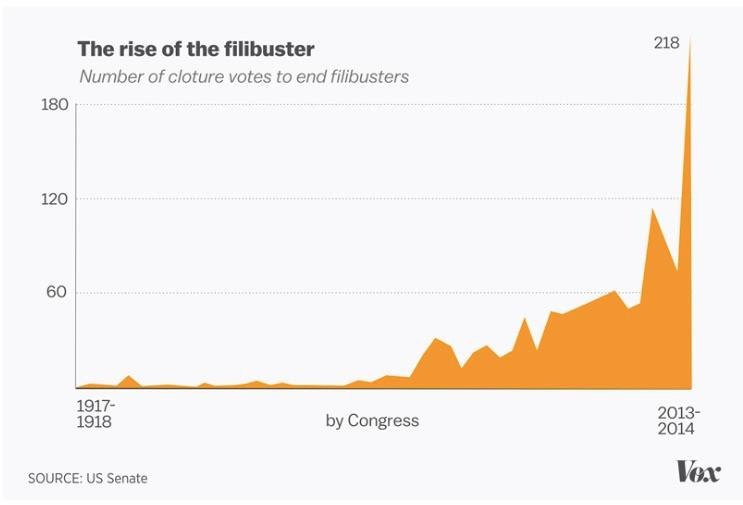 There were more filibusters used between 2009 and 2010 than there were in the 1950s, 1960s, and 1970s combined. A group of researchers compiled the “The Rise of Partisanship and Super-Cooperators in the U.S. House of Representatives” report with the aim of quantifying cross-party cooperation amongst the House members from 1949 to 2012. 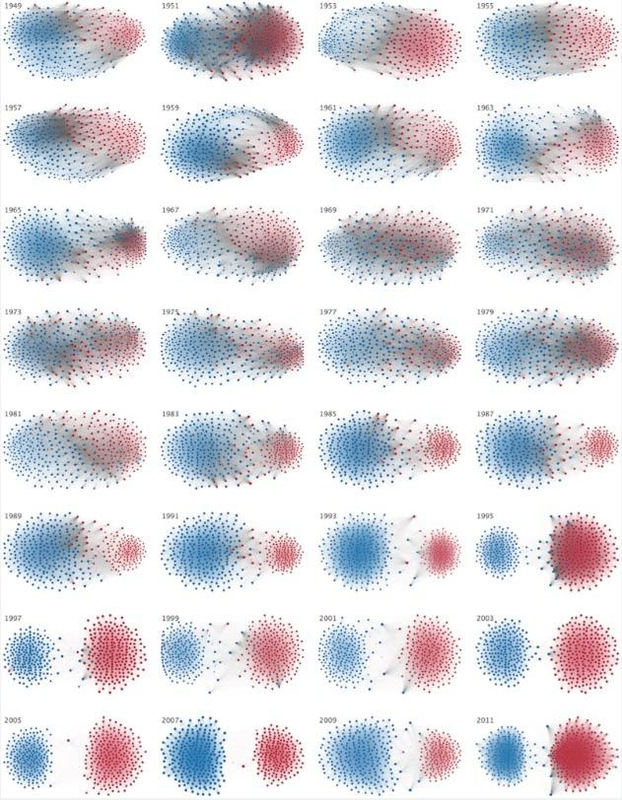 Through a series of fascinating visuals, the shift away from legislative cooperation manages to be even more shocking. One of those visuals follows. Click here or the image for the full report and the methodology and statistical analysis behind this chart. In short, this chart shows how likely a House Democrat (blue node) or House Republican (red node) in a specific Congress since 1949 was to vote with the other party. This observation from political scientist Corwin Smidt says that the “strong” partisans of the 1950s were as likely to vote for the other party as the “independent” is today. Per Smidt’s analysis, the parties are so distinct today that even the independent will find a reason to gravitate to one over the other. To Smidt, it’s not necessarily the voters who’ve changed, but the parties. When the ideological gap between the parties has grown so vast, how can the swing voter swing far enough to reach the other side? The swing voters have served as a check and balance on the parties, forcing them to stay closer to the center, lest the swing voters punish them in the next election cycle. The diminishment of their power means parties can now lurch to the extremes and rely on and cater exclusively to their bases. At this point, it probably goes without saying that our partisan views drive our cognitive biases, which color our opinions whether we know it or not. How did the economy do under President Reagan? Depends on whom you ask. A 1988 survey found that 80% of Republicans and 30% of Democrats accurately said the economy had improved. Similarly, in 1997 under President Clinton, a survey found Republicans far less likely than Democrats to acknowledge the decline in the budget deficit. Might this be a cause for some self-reflection? If we are willing to lie to ourselves about easily provable statistics, how are we capable of objectively appraising the effectiveness of a legislator from the other party? Or our own party? How can we ever have a civilized political dialogue if we can’t be objective? Read on for a twist to this point. Offer people money, and they’ll cop to objective appraisal of economic data. Hmm…While this manipulation pushed people towards honesty, it does beg the question: in what other ways can we be politically manipulated? In its ongoing poll of Americans’ concerns, Gallup found that this February, 17% of Americans name the economy as their biggest concern, with 13% naming government as their second biggest concern. The following chart shows how this data breaks down along party lines. The thinking: Instead of operating a large number of low-frequency bus routes, concentrate vehicles on a smaller number of high-demand routes. This simple philosophy has begun to increase bus ridership in Houston and didn’t cost a dime. Follow the link for the full story. Researchers found that how successfully—or not—managers perform is directly linked to the leadership of those working above them. 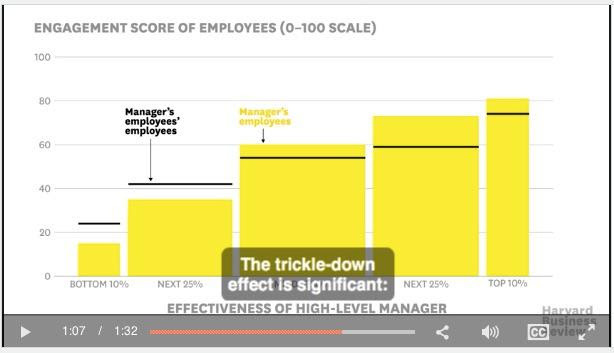 Leaders, want to improve your managers’ performance? Look first at your own. Here is an innovative solution for companies that might not necessarily be able to offer raises, but want to maintain top, young talent. Read on for ways companies can offer and mange this benefit. That’s up from 56% of Gen Xers and 39% of Baby Boomers. Millennials have seen their parents’ retirement plans upended by the Great Recession, job losses and the “gig economy.” Many now expect they will need to continue to work through retirement to derive income. This however, assumes, a physical and mental ability to do so and might under account for ageism in the workplace. In five years, Gen Z—those born from the late mid-90s through the 2010s—will make up one-fifth of the work force. It’s a too soon for sweeping generalizations, but Gen Z is showing clues of their professional proclivities. One big possible shift from Millennials is that Gen Zers might take a longer view of professional development and be more open to lengthy work engagements. Read on for more speculation about the next new employment wave. With all the doom and gloom in the oil patch these days, might we be missing the clues to Houston's next economic boom? Read on for the Armchair's view.